Challenge Goal & Overview: The goal is to successfully build and program a fully autonomous Chain Reaction Device that successfully parks the car in the garage. Your teacher will provide you with (or ask you to build) the car and garage models to be used in this challenge. In most cases you will be asked to work together in teams, but you may be asked to work alone. 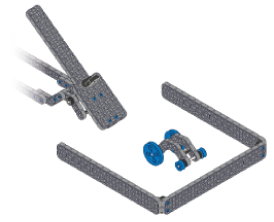 Note: Depending on time and your teacher's plans, you may be asked to use and modify your Chain Reaction Devices previously built for the Chain Reaction Challenge in an earlier unit (adding additional motor(s), sensors, and programming). Otherwise, you may be asked to design, build, and program this challenge from scratch. Please see your teacher for details. 1. Build a four-stage Chain Reaction Device that parks the car in the garage. 2. Your Chain Reaction Device will be autonomous – using four or more Smart Motors, four or more sensors, a Robot Brain, and programming techniques to customize control. Smart Motors ARE considered a sensor in this challenge IF control is customized through the use of programming techniques. 3. Use three or more of the following to construct your stages: Wheel & Axle, Inclined Plane, Wedge, Lever, Pulley, Screw, or Pendulum. You may use a type of simple machine or pendulum more than once if you wish. 4. Please see the Rubric to Evaluate Autonomous Chain Reaction Device for all of the details on how you will be evaluated. 5. Idea Book Pages can be used for planning and troubleshooting. Your teacher will provide further instructions on using the Idea Book Pages.